The term Parkinson's plus syndrome covers several idiopathic diseases which are associated with the occurrence of symptoms which are Parkinson-like but which may be differentiated by diagnostic and clinical/pathophysiological means from Parkinson's disease. The diseases classed as Parkinson plus syndrome (PPS) include multiple system atrophies (MSA), progressive supranuclear palsy (PSP), corticobasal ganglionic degeneration (CBGD) and dementia with Lewy bodies (DLB). Multiple system atrophies subsume in particular Shy-Drager syndrome, olivopontocerebellar atrophy (OPCA) and striatonigral degeneration (SND) (Mark et al, Neurol Clin. 2001, 19(3): 607). The assignment of Pick's disease, hemiparkinsonism and parkinsonism in Alzheimer's and ALS patients and the Westphal variant of Huntington's chorea to PPS is not uniform in specialist literature, but for the purposes of the present patent application, these diseases should be considered to be subsumed under the term PPS in accordance with the classification used by Hobson et al (Hobson et al, Can J Neurol Sci. 2003 March; 30 Suppl 1: p2). Common to the diseases subsumed under Parkinson's plus syndrome is the lack of, or rapidly diminishing, response to L-dopa or dopamine agonists and additional symptoms such as cerebellar or pyramidal signs, early or severe dementia plus speaking and swallowing disorders in the early phase (Mark 2001, supra; Gerlach et al, Die Parkinson-Krankheit, Springer, Vienna N.Y., 2003). Table 1 is an overview of differential-diagnostic criteria for several Parkinson's plus syndromes and Parkinson's disease (also known as idiopathic Parkinson's syndrome, IPS). (Modified according to Mark MH, Lumping and splitting the Parkinson plus syndromes: dementia with Lewy bodies, multiple system atrophy, progressive supranuclear palsy, and corticalbasal ganglionic degeneration. Neurol Clin. 2001 August; 19(3): 607-27 and Gerlach M, Reichmann H, Riederer P, Die Parkinson-Krankheit, Springer Vienna N.Y., 2003). Computed tomography is an important criterion when differentiating between IPS and PPS. Patients with IPS display normal dopamine receptor levels in the SPECT until the late stages, while PPS patients demonstrate an early loss of pre- and postsynaptic dopaminergic neurons, which is associated with an identifiable reduction in the density of dopamine receptors. PET analyses confirm a reduced L-dopa content and L-dopa metabolism in IPS patients (Gerlach et al., 2003, supra). Due to the frequently absent or poor response to L-dopa, drug treatment for PPS is difficult and generally consists in a symptomatic therapy for specific individual symptoms, eg treatment for hypotension. Dopamine receptor agonists are generally ineffective for the treatment of PPS (Mark, 2001, supra). In exceptional cases, there have been reports of a certain therapeutic success with individual dopamine agonists, although these effects appear to be substance-specific. For example, Wenning et al (Lancet, 2004, 3, 93) reported on the therapeutic success of bromocriptine in a trial with six patients, while a controlled trial with lisuride found no efficacy. Since it is known that the majority of dopamine agonists do not act on one sole dopamine receptor, but have a complex receptor profile (Newman-Tancredi, J Pharmacol Exp Ther 2002, 303, 805), the reason for the efficacy of bromocriptine could be the special features of the receptor profile or other not further characterised substance-specific properties. Parkinson's plus syndrome is generally linked to a dopaminergic neurodegeneration in the substantia nigra (Mark, 2001, supra). Therefore, successful therapy could be expected from the use of effective neuroprotectives which inhibit the progressive degradation of dopaminergic neurons (Dawson and Dawson V L, Nat Neurosci. 2002 November; 5 Suppl: 1058). Rotigotine [(−)-5,6,7,8-tetrahydro-6-[propyl[2-(2-thienyl)ethyl]amino]-1-naphtol] is known from the prior art as a dopamine agonist and symptomatic therapy for Parkinson's disease. WO 02/089777 describes, for example, the transdermal administration of rotigotine in Parkinson patients and the associated improvement in the UPDRS (Unified Parkinson's Disease Rating Scale) scores and this has also been described by other authors (Metman et al, Clin Neuropharmacol. 2001, 24(3):163; Mucke H A, Rotigotine Schwarz Pharma. IDrugs. 2003 September; 6(9):894; The Parkinson Study Group, Arch Neurol. 2003 60(12):1721). The UPDRS score is an important tool for the diagnosis or treatment of patients with Parkinson's disease (Fahn S, Elton R L, Members of the UPDRS Development Committee (1987) Unified Parkinson's Disease Rating Scale. In: Fahn, S, C D Marsden, D B Calne, M Goldstein (eds) Recent Developments in Parkinson's Disease. Vol II. Macmillan Healthcare Information, Florham Park (N.J.), pp 153-163, 293-304). However, the UPDRS score only determines the effect of an active substance on the symptoms of Parkinson's disease. It does not provide any information as to whether an active substance influences the dopaminergic cell destruction at the root of the symptoms. However, apoptotic processes play an important role in the pathogenesis of Parkinson's plus syndrome in particular with regard to the destruction of dopaminergic neurons (Lev et al, Prog Neuropsychopharmacol Biol Psychiatry. 2003; 27(2): 245; Michel et al, Rev Neurol (Paris). 2002; 158 Spec no 1: p 24). In addition, various other neurodegenerative processes are thought to have a decisive influence on the development of parkinsonism and Parkinson's plus syndrome (Hirsch et al, Ann N Y Acad Sci. 2003; 991: 214). Therefore, there is a desire for neuroprotective substances that are able to stop or even reverse dopaminergic cell destruction (Vila et al, Nat Rev Neurosci. 2003; 4(5): 365). Here, the MPTP model is considered to be predictive for the required neuroprotective properties (Dawson, 2002, supra; Eberhardt O, Schulz J B, Toxicol Lett. 2003, 139(2-3): 135). Experimental investigations have now surprisingly revealed that rotigotine, which up to now has only been used for symptomatic therapy of idiopathic Parkinson's disease, has neuroprotective properties. Rotigotine surprisingly demonstrates the desired pharmacological profile in both an acute and a subacute MPTP model (Table 2, FIGS. 1 and 2). The results of the investigation suggest that rotigotine prevents apoptotic processes. For example, rotigotine demonstrates a neuroprotective action in a Parkinson's mouse model: following the acute administration of MPTP, which causes Parkinson's symptoms in humans and monkeys, on the one hand, the number of degenerating neurons in the acute phase was measured and on the other the functional integrity of the striatum in the subacute phase was established by determining the density of the dopamine transporter in the terminal nerve endings. It was possible to demonstrate in both cases that rotigotine had a neuroprotective action: on the one hand, the number of degenerating neurons in the mesencephalon was reduced following the administration of rotigotine (Table 2) and on the other the dopaminergic innervation of the striatum is virtually completely retained or restored (FIGS. 1 and 2). The neuroprotective action of rotigotine was also investigated on monkeys in a pilot study. In the model used, which reflects the progressive course of dopaminergic cell destruction in primates, monkeys (macaques) were injected with subthreshold toxic doses of MPTP over several days. The parkinsonian symptoms developed in the model over a period of approximately 2 weeks. As soon as a specific degree of damage was reached, daily injections of rotigotine were given in a formulation giving rise to a continuous plasma level over 24 h. The injections of MPTP were stopped as soon as the motor activity in the controls had reduced by a specific degree (approximately 5 days later). The animals' behaviour was evaluated every day. Six weeks after the commencement of the MPTP application, the injections of rotigotine were stopped and the animals were observed for a further two weeks with no treatment. It was noted that the motor activity of the animals significantly improved under treatment and also in the following wash-out phase. At the end of rotigotine application or at the end of the wash-out phase, in each case one group of animals was sacrificed and the condition of the basal ganglia investigated histologically and biochemically. The density of the nerve endings in the striatum was much higher than it was in the untreated animals. The content of preproenkephalin, an indicator of the intact crosslinking in the ‘indirect pathway’ of the basal ganglia, indicated a tendency toward normalisation after the treatment and after the wash-out phase. The results show that the neuroprotective potential of rotigotine can also be demonstrated in a primate model of the dopaminergic cell destruction. Therefore, it can be assumed that there is an antiapoptotic, neuroprotective action in humans as well. Therefore, rotigotine provides an active substance which is ideally suited for the production of a medicinal preparation for the treatment and/or prevention of dopaminergic neuron loss in patients with Parkinson's plus syndrome, since in addition to its neuroprotective action, the dopaminergic action of rotigotine can also be beneficial. Compared to the previous use of rotigotine, which was restricted to the purely symptomatic dopaminergic treatment of Parkinson's disease-patients, the treatment of patients with Parkinson's plus syndrome is therefore disclosed as a new field of application and to be precise also for patients who do not respond, or respond inadequately, to treatment with L-dopa or dopamine agonists with no neuroprotective action. Therefore, one subject matter of the invention is the use of rotigotine, its salts and prodrugs as medicaments for the prevention and/or treatment of Parkinson's plus syndrome, whereby the term Parkinson's plus syndrome includes the following diseases: multiple system atrophies, progressive supranuclear palsy, corticobasal degeneration, dementia with Lewy bodies, Pick's disease, hemiparkinsonism, parkinsonism in Alzheimer's and ALS patients and the Westphal variant of Huntington's chorea. The diseases to be treated with rotigotine are hereby preferably selected from the following group: multiple system atrophies, progressive supranuclear palsy, corticobasal degeneration and diffuse dementia with Lewy bodies. Another subject matter of the invention is a method for treating a patient with Parkinson's plus syndrome by the administration of a therapeutically sufficient quantity of rotigotine, its salts and/or prodrugs or by the administration of a medicament containing rotigotine or one of its salts and/or prodrugs. For the purposes of the present patent application, the “prodrugs” of rotigotine should be understood in particular to mean compounds which are cleaved, converted or metabolised in the human body, in particular in the plasma, or on passage through the skin or mucous membrane in a therapeutically effective quantity to form rotigotine. Therefore, the relevant prodrugs of rotigotine are in particular derivatives of the phenolic hydroxy group, in particular esters, eg aryl carbonyl esters, alkyl carbonyl esters or cycloalkyl carbonyl esters, in particular alkyl carbonyl esters and cycloalkyl carbonyl esters each with up to 6 carbon atoms, carbonates, carbamates, acetals, ketals, acyloxyalkyl ethers, phosphates, phosphonates, sulfates, sulfonates, thiocarbonyl esters, oxythiocarbonyl esters, thiocarbamates, ethers and silylethers. The term “alkyl carbonyl esters” comprises compounds in which the oxygen atom of rotigotine is in each case bound to the —C(O)-alkyl group. An alkyl carbonyl ester is formally formed from the esterification of the phenolic hydroxy group with an alcanoic acid, eg with acetic acid, propionic acid, butyric acid, isobuyric acid or valeric acid. The term “cycloalkyl carbonyl esters” comprises compounds in which in each case the oxygen atom of rotigotine is bonded to the —C(O)-cycloalkyl group. The term “aryl carbonyl esters” comprises compounds in which in each case the oxygen atom of rotigotine is bonded to the —C(O)-aryl group. The term “carbonates” comprises compounds in which in each case the oxygen atom of rotigotine is bonded to the —C(O)—O—R group. The term “carbamates” comprises compounds, in which in each case the oxygen atom of rotigotine is bonded to the —C(O)—NRR1, —C(O)—NH—R1 or —C(O)—NH2 group. The term “acetals” comprises compounds, in which in each case the oxygen atom of rotigotine is bonded to the —CH(OR)R1 group. The term “ketals” comprises compounds, in which in each case the oxygen atom of rotigotine is bonded to the —C(OR)R1R2 group. The term “acyloxyalkyl ethers” comprises compounds, in which in each case the oxygen atom of rotigotine is bonded to the —CHR—O—C(O)—R1 or —CH2—O—C(O)—R1 group. The term “phosphates” comprises compounds, in which in each case the oxygen atom of rotigotine is bonded to the —P(O2H)OR group. The term “phosphonates” comprises compounds, in which in each case the oxygen atom of rotigotine is bonded to the —P(O2H)R group. The term “sulfates” comprises compounds, in which in each case the oxygen atom of rotigotine is bonded to the —S(O)2OR group. The term “sulfonates” comprises compounds, in which in each case the oxygen atom of rotigotine is bonded to the —S(O)2R group. The term “thiocarbonyl esters” comprises compounds, in which in each case the oxygen atom of rotigotine is bonded to the —C(═S)—R group. The term “oxythiocarbonyl esters” comprises compounds, in which in each case the oxygen atom of rotigotine is bonded to the —C(═S)—O—R group. The term “thiocarbamates” comprises compounds, in which in each case the oxygen atom of rotigotine is bonded to the —C(═S)—N—RR1, —C(═S)—NH—R1 or —C(═S)—NH2 group. The term “ethers” comprises compounds, in which in each case the oxygen atom of rotigotine is bonded to the —R group. In the above definitions of prodrugs, each of R, R1, R2 is independently selected from hydrogen, alkyl, cycloalkyl or aryl, and preferably from the group C1-6 alkyl, C3-10 cycloalkyl and phenyl. “Alkyl” can be a branched or unbranched alkyl group which preferably has 1 to 10 C atoms, particularly preferably 1 to 6 C atoms. Alkyl groups can also be substituted with one or more substituents, for example with halogen. “Cycloalkyl” is an alkyl group, which may consist of pure ring-forming C atoms or may optionally bear further branching C atoms. Preferred chain lengths are 3-10, particularly preferably 4-8 or 4-6 C atoms. “Aryl” is preferably phenyl. Phenyl can optionally be substituted in one or more positions, eg with alkoxy, alkyl, halogen or nitro. The production by reaction of rotigotine with corresponding reactive precursors, such as acid chlorides, acid anhydrides, carbamyl chlorides, sulfonyl chlorides etc., is known to a person skilled in the field of clinical chemistry and may be found in the relevant specialist literature. Examples in literature include: Bundgaard: Design of Prodrugs, Elsevier, Amsterdam, 1985; Higuchi and Stella: Pro-drugs as novel drug delivery systems in American Chemical Society, Washington DC, 1975; Sloan: Prodrugs—Topical and Ocular Drug Delivery, Ed: M. Dekker, 1992; Roche: Design of biopharmaceutical properties through prodrugs and analogs, Washington, DC, 1977. Various prodrugs of the racemate of rotigotine (N-0437) and corresponding manufacturing instructions and investigational methods are described, for example, in Den Haas et al, Naunyn-Schmiedeberg's Arch Pharmacol 1990, 342, 655; Den Haas et al, Naunyn-Schmiedeberg's Arch Pharmacol 1990, 341, 186 and Den Haas et al, J Pharm Pharmacol 1991, 43. 11. The basic suitability of a rotigotine derivative as a prodrug can be determined by incubating the compound under defined conditions with an enzyme cocktail, a cell homogenate or an enzyme-containing cell fraction and demonstrating that rotigotine can be formed in a sufficient quantity. A suitable enzyme mixture is, for example, contained in the S 9 liver preparation made by the company Firma Gentest, Woburn, Mass., USA (embodiment 5). Alternatively, incubation with fresh blood or plasma or even a homogenate of the hypodermis may be performed in order to demonstrate the liver-independent metabolisation of the prodrug to form the active component. Transdermal application requires an in vitro examination of permeation on excised skin. The final evidence of suitability and potential efficacy in the medical models is performed by determining the rotigotine formed from the prodrug in the plasma: in-vivo, a prodrug should release sufficient rotigotine to achieve a therapeutically effective steady-state concentration of rotigotine in the plasma, as is already known from clinical or preclinical investigations. In this regard, effective concentrations are generally rotigotine concentrations of between 0.01 and 50 ng/mL, preferably between 0.05 ng and 20 ng/mL and particularly preferably between 0.1 and 10 ng/mL plasma. Rotigotine is the (S)-enantiomer of 5,6,7,8-tetrahydro-6-[propyl[2-(2-thienyl)ethyl]amino]-1-naphtol. This means that the content of (R)-enantiomers in the medicament is low according to the invention. The (R)-enantiomer is preferably present with a content of <10 mole %, particularly preferably with a content of <2 mole % and quite particularly preferably with a molar content of <1%, based on the total quantity of rotigotine, in the medicament. Rotigotine and its prodrug can be present as free bases or in the form of physiologically acceptable salts, eg in the form of hydrochloride, in the medicament. “Physiologically acceptable salts” include non-toxic addition salts of rotigotine with organic or inorganic acids, eg HCl. There are various methods of application available for the administration of rotigotine and its prodrugs which a person skilled in the art can select and adjust according to the requirement, condition and age of the patient, the required dose and desired application interval. A preferred method for the administration of rotigotine is transdermal administration. The pharmaceutical form can in principle be selected from, for example, ointment, paste, spray, film, plaster or an iontophoretic device. Preferably, rotigotine is in this regard applied to the patient's skin in plaster form, whereby the active substance is preferably present in a matrix of adhesive polymer, eg a self-adhesive adhesive polysiloxane. Examples of suitable transdermal formulations may be found in WO 99/49852, WO 02/89777, WO 02/89778, WO 04/58247, WO 04/12730, WO 04/12721 or WO 04/50083. A pharmaceutical form of this kind permits the establishment of an extensively constant plasma level and hence constant dopaminergic stimulation over the entire application interval (WO 02/89778; Metman, Clinical Neuropharmacol 24, 2001, 163). If, on the other hand, a medicinal product in the form of a subcutaneous or intramuscular depot form is desired, the rotigotine can, for example, be suspended as a salt crystal, eg as a crystalline hydrochloride, in a hydrophobic, anhydrous medium and injected, as described in WO 02/15903, or also administered in the form of microcapsules, microparticles or implants based on biodegradable polymers, such as is described, for example, in WO 02/38646. Other conceivable forms for the administration of rotigotine and its prodrug are transmucosal formulations, eg sublingual or nasal sprays, rectal formulations or aerosols for pulmonary administration. Suitable doses of rotigotine are between 0.05 and approximately 50 mg/day, whereby preferably daily doses of between 0.1 and 40 mg and in particular between 0.2 and 20 mg/day are administered. In this regard, the dose can be increased gradually, which means that the treatment can optionally be commenced with low doses which are then increased to the maintenance dose. It is evident to a person skilled in the art that the dosage interval may be varied according to the quantity applied, the method of application and the patient's daily requirement. For example, a formulation for transdermal application is conceivable, for example for once-a-day, three-day or seven-day administration while a subcutaneous or intramuscular depot can permit injections in a one, two or four-weekly cycle, for example. In the neuroprotective pharmaceutical form, in addition to rotigotine, other active substances can be present which prevent the progression of dopaminergic cell loss. Examples of this include substances with an antiapoptotic action (minocyclins, FK-506, cyclosporin A, zVAD) and neurotrophins, such as, for example, glial cell derived neurotrophic factor (GDNF). In a combination preparation, the release of the active substances used in each case can take place to a large extent simultaneously or even sequentially. Sequential administration can, for example, be achieved by a pharmaceutical form, eg an oral tablet, having two different layers with different release profiles for the different pharmaceutically active components. A combination preparation according to the invention comprising a rotigotine formulation can alternatively also take the form of a “kit of parts” in which the antiapoptotic active substances to be administered are present in formulations which are separate from each other, which are then administered simultaneously or in a temporally graduated manner. It is evident to a person skilled in the art that, in the context of the present invention, different pharmaceutical forms and application schedules are conceivable, all of which are objects of the invention. 1.8 g rotigotine (free base) were dissolved in 2.4 g ethanol and added to 0.4 g Kollidon 90F (dissolved in 1 g ethanol). This mixture was added to a 74% solution of silicone polymers (8.9 g BioPSA 7-4201+8.9 g BIO-PSA 7-4301 [Dow Corning]) in heptane. After the addition of 2.65 g petroleum ether, the mixture was agitated for 1 hour at 700 rpm to obtain a homogeneous dispersion. After lamination on polyester, it was dried at 50° C. The final weight of the plaster was 50 g/cm2. 1411.2 g Miglyol 812 were weighed in a Duran flask. 14.4 g Imwitor 312 were added to the Miglyol and then heated for 30 minutes under agitation to 80° C. The clear solution was cooled to room temperature and filtered. (b) 1188 g of the solution produced in (a) were transferred to a glass laboratory reactor, 12 g rotigotine HCl added and homogenised for 10 minutes with an Ultraturrax at 10 000 rpm under nitrogen. The suspension was filled into brown glass flasks with a running Ultraturrax (2000 rpm). To induce intoxication, mice were administered 80 mg/kg of the neurotoxin 1-methyl-4-phenyl-1,2,3,6-tetrahydro-pyridine (MPTP) (in portions of 20 mg/kg in two-hourly intervals, groups 3-6 in FIGS. 1 and 2) resulting in the degeneration of about 50-60% of the neurons of the substantia nigra (maximum degeneration in group 3 in FIGS. 1 and 2). Rotigotine was administered daily in doses of 0.3, 1 or 3 mg/kg respectively over 7 days as a so-called ‘slow-release formulation’ (see embodiment 2) (groups 4-6 in FIGS. 1 and 2). A group of MPTP-treated animals (group 3) was given rotigotine-vehicle solution (see embodiment 2 without rotigotine HCl) and served as a reference. The controls were groups 1, 2 and 7, whereby group 1 is not given any treatment, group 2 is treated with the vehicle-solutions for MPTP and rotigotine, and group 7 was exclusively given rotigotine. The animals were sacrificed on day 8, their brains removed and frozen. Frozen sections were incubated with 100 pm[125I] PE21 ([125I]-(E)-N(3-iodoprop-2-enyl)-2β-carboxymethyl-3β-(4′-methylphenyl)-nortropane) in a phosphate buffer, pH 7.4 in order to mark the quantity of dopamine transporters still present in the striatum as an indicator of the quantity of functioning nerve endings. Rotigotine improves the survival of the neurons and the nerve endings in relation to the dose. This is clear evidence of the neuroprotective properties of the substance (FIG. 1 and 2). To induce intoxication, mice were administered 80 mg/kg of the neurotoxin 1-methyl-4-phenyl-1,2,3,6-tetrahydro-pyridine (MPTP) (in portions of 20 mg/kg at two-hourly intervals) resulting in the degeneration of approximately 50-60% of the neurons in the substantia nigra. Approximately 16 hours previously, rotigotine was added in doses of 0.3, 1 or 3 mg/kg respectively as a so-called ‘slow-release formulation’ (see embodiment 2). Diffusion and absorption latencies mean that rotigotine is optimally available when MPTP is added. Animals that were only given the vehicle solution (see embodiment 2 without rotigotine HCl) served as controls. After 24 hours, the animals were sacrificed and the brains fixed. The brain sections were stained with FluoroJade for the identification of degenerating cells. Immunohistochemical marking of the tyrosine hydroxylase was used to identify dopaminergic neurons. The staining of the tyrosine hydroxylase did not identify any differences between the treated and untreated animals; the FluoroJade staining revealed a large number of degenerating neurons; however, the neurons were not completely removed (which explains the absence of any difference between the tyrosine hydroxylase staining); this suggests that the cell destruction was taking place apoptotically and was not completed at the time of measurement (the apoptotic cells had not been completely dissolved or phagocyted). The number of the degenerating neurons was approximately 50% lower after the application of rotigotine, which is further confirmation of the neuroprotective properties of the substance (Table 2). The microsome fraction containing the essential metabolic enzymes was obtained from liver cell homogenates from humans, monkeys, dogs, rats and/or mice by differential centrifugation; alternatively, it is also possible to obtain the cytoplasmatic fraction. The subcellular fraction was suspended with a buffer in such a way that a solution with a defined protein content was obtained. After the addition of 1 μm of the prodrug to be tested, it was incubated at 37° C. for 60 minutes. 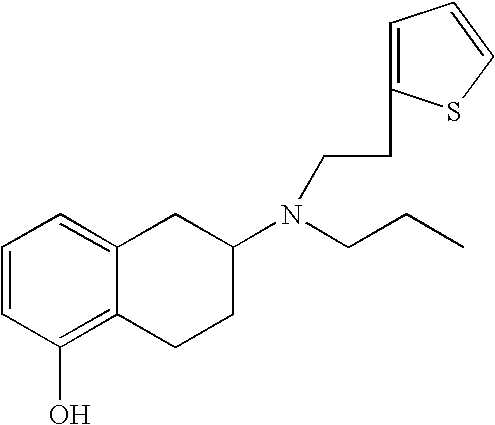 Then rotigotine was quantified by means of HPLC/UV or by means of HPLC/MS and related to the quantity used. For more detailed analyses, concentration or time series were investigated. 8. A method for prevention and/or treatment of a Parkinson's plus syndrome in a patient, comprising administering to the patient a compound selected from the group consisting of rotigotine, physiologically acceptable salts of rotigotine, and rotigotine prodrugs. 9. The method of claim 8 wherein the Parkinson's plus syndrome is selected from the group consisting of multiple system atrophies, progressive supranuclear palsy, corticobasal degeneration, diffuse dementia with Lewy bodies, and combinations thereof. 10. The method of claim 8, wherein the Parkinson's plus syndrome comprises a failure of the patient to respond to L-dopa treatment. 11. The method of claim 8, wherein the compound is administered orally, parenterally, transdermally or transmucosally. 12. The method of claim 8, wherein the compound provides an extensively constant plasma level of rotigotine in the plasma of the patient over an application interval. 13. The method of claim 11, wherein the compound is administered transdermally. 14. The method of claim 8, wherein the compound is administered to provide a rotigotine dosage of 0.05 mg to approximately 50 mg per day. 15. The method of claim 8, wherein the compound is administered to provide a plasma level of rotigotine between 0.01 and 50 ng/mL. 16. The method of claim 15, wherein the rotigotine achieves a steady-state plasma level. 17. The method of claim 8, wherein the compound is administered to provide a plasma level of rotigotine between 0.05 and 20 ng/mL. 18. The method of claim 8, wherein the compound is administered to provide a plasma level of rotigotine between 0.1 and 10 ng/mL. 19. The method of claim 8, wherein rotigotine is administered in the form of a prodrug that is an ether, ester, thiocarbonyl ester, carbamate, thiocarbamate, carbonate, acetal, ketal, acyloxy alkyl ether, oxythiocarbonyl ester, phosphate, phosphonate, sulfate, sulfonate or silylether of rotigotine. 20. The method of claim 19, wherein the prodrug is a C1-6 alkyl carbonyl ester of rotigotine. 21. The method of claim 8, wherein the compound is rotigotine hydrochloride. 22. The method of claim 8, further comprising administering at least one further active agent effective for prevention and/or treatment of the Parkinson's plus syndrome. 23. The method of claim 22, wherein the compound and the at least one further active substance are separate and are administered to the patient simultaneously. 24. The method of claim 22, wherein the compound and the at least one further active substance are separate and are administered to the patient in a temporally graduated manner. 25. A therapeutic combination comprising rotigotine or a physiologically acceptable salt or prodrug thereof and at least one further active substance that prevents or reduces the rate of progression of dopaminergic cell loss in a patient. 26. The therapeutic combination of claim 25, wherein the at least one further active substance is selected from the group consisting of antiapoptotic substances, neurotrophins, and combinations thereof. 27. The therapeutic combination of claim 26, wherein the at least one further active substance is an antiapoptotic substance selected from the group consisting of minocyclin, FK-506, cyclosporin A, zVAD, and combinations thereof. 28. The therapeutic combination of claim 26, wherein the at least one further active substance is a neurotrophin comprising glial cell derived neurotrophic factor (GDNF). 29. A pharmaceutical form comprising the therapeutic combination of claim 25, wherein the rotigotine has a different release profile than the at least one further active substance. 30. The pharmaceutical form of claim 29, wherein the pharmaceutical form is an oral tablet comprising a first portion comprising rotigotine and at least one additional portion comprising the at least one further active substance. 31. A kit for treatment and/or prevention of a Parkinson's plus syndrome in a patient, the kit comprising a first medicinal preparation comprising rotigotine or a physiologically acceptable salt or prodrug thereof and a second medicinal preparation comprising at least one further active substance that prevents or reduces the rate of progression of dopaminergic cell loss in a patient.